Fischer Connectors has confirmed that its MiniMax™ Series of connectors has been used in Hexadrone Systems’ Tundra-M UAS (unmanned aerial system). 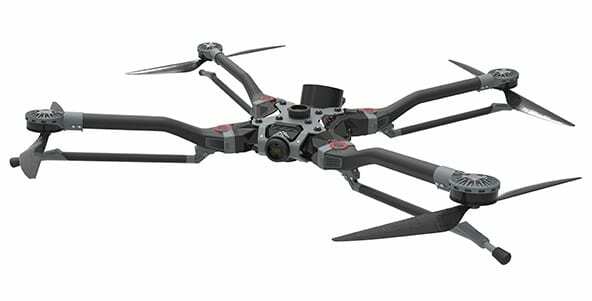 The Tundra-M is a waterproof, modular quadcopter drone designed to be suitable for a variety of commercial and industrial applications. Featuring rapidly switchable arms and three quick release attaches, the Tundra-M is a highly flexible system that can be equipped with a range of payloads for different missions. Its rugged waterproof design makes it highly resistant to extreme weather conditions. Hexadrone Systems selected Fischer’s MiniMax™ Series of connectors for use in the HDMI, USB and CAN interconnection systems of the Tundra-M. Hexadrone required a solution that would allow them to design the Tundra-M with a high degree of modularity, while providing rugged, watertight construction and keeping SWaP (size, weight and power) profiles to a minimum. The connectors were an ideal choice due to their lightweight, compact design and their easy-to-handle blind mating connection. All MiniMax™ connectors are IP68 sealed mated and unmated, and can withstand more than 5000 mating cycles. They can also be optimised for full USB3.0 performance to the full S-parameter standards with cables up to 2m. MiniMax™ connectors are available in 06 and 08 sizes with receptacles of 10mm and 12mm diameter and with configurations of 4-12 contacts. They are offered in three different locking systems: push-pull, screw and quick-release.